I have a handful of pretty little utensils that were getting lost in the big crock I keep my whisks, spoons and spatulas in on my counter. 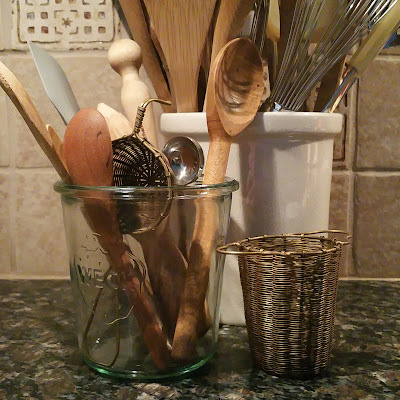 I was tending to the laundry on Monday and happened to glance over at a lidless canning jar on the shelf and it hit me that it would be the perfect receptacle for these short-handled things that I want to use and admire on a daily basis. It has worked perfectly this week... I only wish that I had thought of it sooner! Funny how sometimes the solution hides from us in plain sight!